Registration for this novice oriented event opens at 6:45 PM at the Eastgate Park & Ride Parking lot in Bellevue (14200 SE Eastgate Way). The drivers meeting is at 7:10 and first car out will be 7:31. The entry fee is $20. Don’t forget that we’re running the “bring a new team and your entry is free” special. Come on out and join us for a good time, and bring your friends! Thanks to ORCA for putting on a great event. Steve was up to his usual tricks, including a trap for “S AT STOP” without MBCU that EVERYONE fell for. The elk were out in North Bend, including a huge bull watching his harem. Mount Si looked spectacular. We visited Snoqualmie, Carnation and Ames Lake, eventually winding out way to the finish in Sammamish. I didn’t feel like the route was particularly twisty, until I realized my arm were sore after the rally from turning the wheel! That is a good sore! Congratulations to the winners, and especially car 7 who, in spite of several off course excursions, persevered and found all three checkpoints. It was a good time, and we are sorry if you missed it. 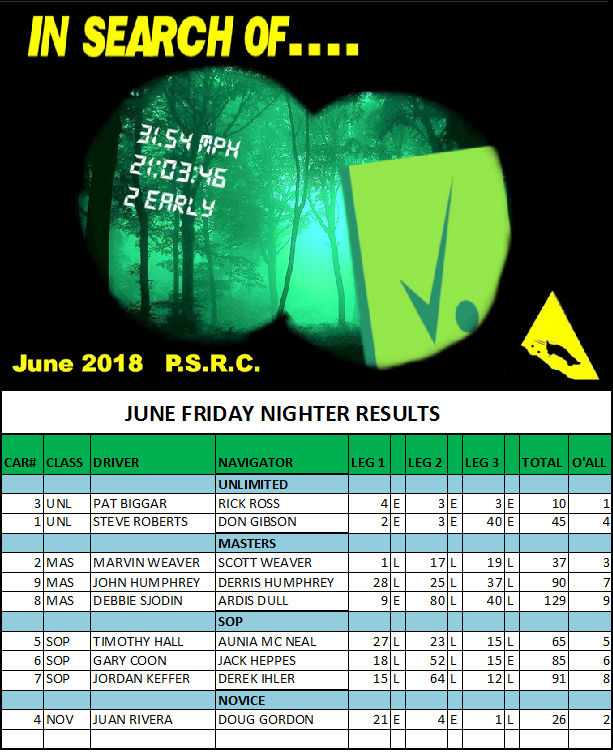 We are a week away from the July Friday Nighter, an event that will have daylight through most of the rally. 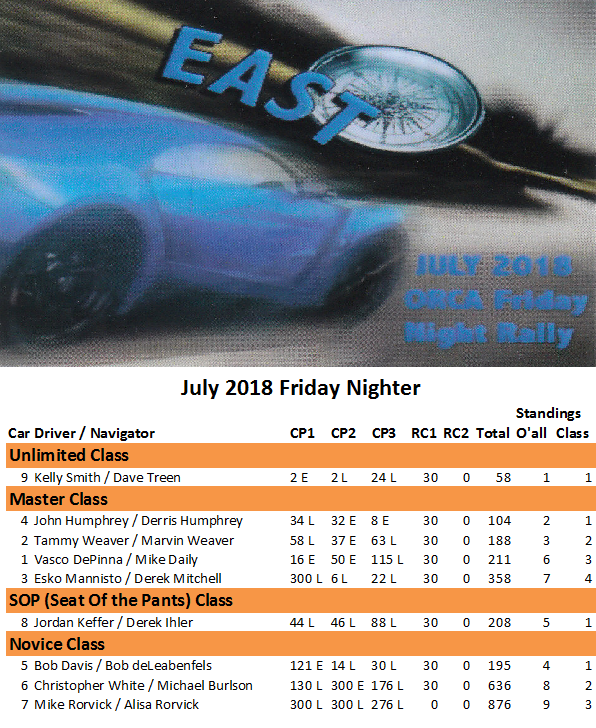 This year, the event is presented by ORCA, and the rallymaster is the master himself, Steve Roberts. Steve routinely chooses cool roads and then finds cool traps on them or he finds cool traps and then find cool roads to get there. Either way, the rallies have been fun and challenging. The name of the rally is EAST! I’d guess that to mean that the rally will be using the roads east of Issaquah. Steve says the theme is “do you know your general instructions?” That means there will be a few traps, at least. With any luck, the rally will be scenic as well. The last time we were tooling around east of Issaquah, we saw a herd of elk. Plus there are many places out that way to get good views of Mt. Si. And as I mentioned, we will have daylight for much of the event. Registration for this novice oriented event opens at 6:45 PM at the Eastgate Park & Ride Parking lot in Bellevue (14200 SE Eastgate Way). The drivers meeting is at 7:10 and first car out will be 7:31. The entry fee is $20. Don’t forget that we’re running the “bring a new team and your entry is free” special. The rally finishes at Mod Pizza, 22833 NE 8th St in Sammamish. Come on out and join us for a good time, and bring your friends! Thanks to the crew from PSRC for putting on a fine fun event.